Fremont is the county seat of Sandusky County, Ohio. It was originally known as Lower Sandusky. Lower Sandusky had its beginnings as a village of the Wyandot natives. During the 1750s, the French constructed a trading post to participate in the fur trade with the Wyandots. During the late 1700s and the early 1800s, other colonial settlers moved into the area. Elizabeth Foulks and James Whittaker were some of the first white people to live in Lower Sandusky. They were captives of the Wyandots and fell in love. They married in Lower Sandusky in 1785. Like the residents of Upper Sandusky, the white people who settled here were in direct violation of the Treaty of Greenville. During the War of 1812, the United States Army considered removing these people from the land by force. The soldiers did not carry out the threat. Fort Stephenson, an important American military post, was also built here during the war. Although the Wyandots still called Lower Sandusky home, by the 1830s, the community had a sizable white and African American population. Many of the African Americans were runaways and sought safety by living together. Throughout the 1830s, 1840s, and 1850s, slave hunters passed through the area looking for runaways. Lower Sandusky became the Sandusky County seat in 1821. The town grew slowly. In 1835, Cyrus Bradley traveled through Lower Sandusky. He described it as a swampy place and a breeding ground for flies. Despite this, Lower Sandusky emerged as an important economic center. Located on the Sandusky River, the community became active in the shipbuilding industry. Fishing also helped support early residents. Most early manufacturing establishments were connected to agriculture. They included several saw and flour mills, as well as the first sugar mill in Ohio. The village might have grown even more quickly if canals had connected it with other communities. During the late 1830s and early 1840s, Lower Sandusky did gain access to the rest of the state through railroads, and the town continued to grow. In 1849, Lower Sandusky residents changed the village's name to Fremont, in honor of John C. Fremont, who had just acquired California for the United States. Among Fremont's most prominent residents was Rutherford B. Hayes, an Ohio governor as well as the nineteenth President of the United States. Hayes moved to his home, Spiegel Grove, in 1873, just three years before the American voters elected him President. Sardis Birchard, Hayes's uncle, originally built the house from 1859 to 1863. Hayes remodeled it on several different occasions, primarily to accommodate his numerous guests. Today, Spiegel Grove is part of the Rutherford B. Hayes Presidential Center. Founded in 1916, the Rutherford B. Hayes Presidential Center was the first presidential library in the United States. Today, Fremont remains the county seat of Sandusky County. Many of the city's businesses are agricultural. Other businesses include cutlery, battery, rubber, electric switch, and sugar manufacturers, as well as pork processors. 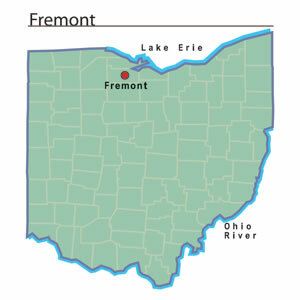 Many Fremont residents commute to Toledo, thirty miles away. Sandusky County also has several important manufacturing establishments, including Whirlpool Corporation, Heinz USA, and Lear. Fremont had 17,135 residents in 2000. The population of Sandusky County was 61,792. Fremont Industrial Development Committee of the Chamber of Commerce of Sandusky County. Facts About Fremont: Community Information Prepared by the Fremont Industrial Development Committee of the Chamber of Commerce of Sandusky County. N.p. : n.p., 1965. Howe, Henry. Historical Collections of Ohio in Two Volumes. Vol. II. Cincinnati, OH: C.J. Krehbiel & Co., Printers and Binders, 1902. Vogel, John J. Indians of Ohio and Wyandot County. New York, NY: Vantage Press, 1975.